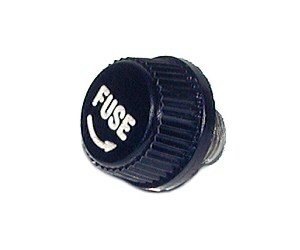 Threaded fuse holder cap for GMA fuse holders. Works with 3/16"x3/4" (5x20mm) glass fuses. 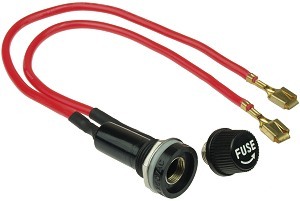 Compatible with GMA fuse holder (item # FUS-330) sold below. Fuse holder for 3/16"x3/4" (5x20mm) glass fuses. Suitable for electric scooters and bikes that use 30 Amp or lower rated fuses. 15 Amp continuous duty rating rating. Solder terminals. Fits 9/16" (15mm) hole. Mounting hardware included. Threaded fuse holder cap for AGC fuse holders. Works with 1/4"x1-1/4" (6x32mm) glass fuses. 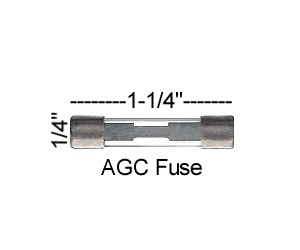 Compatible with AGC fuse holder (item # FUS-340) sold below. 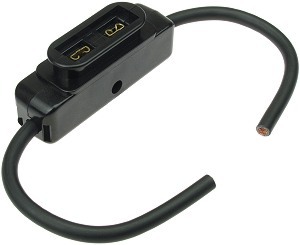 This is our most popular fuse holder and fits most makes and models of electric scooters and bikes. Fuse holder for 1/4"x1-1/4" (6x32mm) glass fuses. Suitable for electric scooters and bikes that use 30 Amp or lower rated fuses. 15 Amp continuous duty power rating. Solder terminals. Fits 9/16" (15mm) hole. Mounting hardware included. Fits many makes and models of electric scooters and bikes. Fuse holder for 1/4"x1-1/4" (6x32mm) glass fuses. Suitable for electric scooters and bicycles that use 30 Amp or lower rated fuses. 15 Amp continuous duty power rating. Pre-wired with 6.3mm female end terminals. Fits 9/16" (15mm) hole. Mounting hardware included. Made by BUSS®. 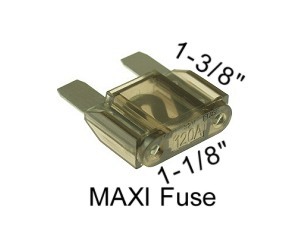 Heavy-duty fuse holder for 1/4"x1-1/4" (6x32mm) glass fuses. Solder terminals. Suitable for electric scooters and bikes that use 40 Amp or lower rated fuses. 30 Amp continuous duty power rating. Fits 1/2" (12mm) hole. Mounting hardware included. 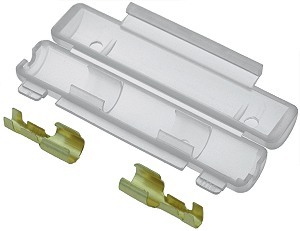 In-line translucent clamshell AGC fuse holder for 1/4"x1-1/4" (6x32mm) glass fuses. Clamshell snaps shut securely housing fuse and terminals inside. Crimp or solder on wire terminals for 22 through 16 AWG wire. Terminals are compatible with CRM-85 and CRM-87 crimping tools. 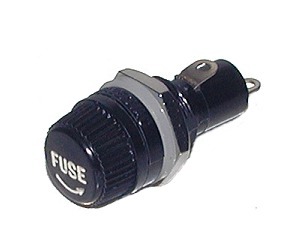 In-line ATO fuse holder with protective cap. Crimp or solder on wire terminals for 14 through 12 AWG wire. Terminals are compatible with CRM-85 and CRM-87 crimping tools. 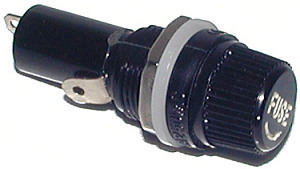 In-line ATO fuse holder with protective cap. 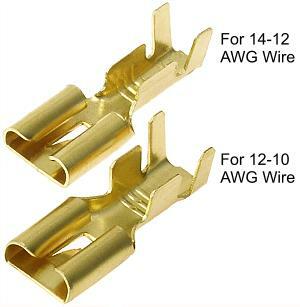 Crimp or solder on wire terminals for 12 through 10 AWG wire. Terminals are compatible with CRM-85 and CRM-87 crimping tools. Extra terminals for item # FUS-351 and FUS-352 sold above. Terminals are compatible with CRM-85 and CRM-87 crimping tools. Panel mount ATO fuse holder with removable snap-on cap. Mounts into electric scooter or bike frame or battery box. 1/4" wide push or solder on terminals on back side of fuse holder. In-line ATO fuse holder with two wire leads. 16 AWG black power cable wire. 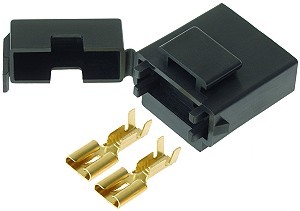 In-line ATO fuse holder with protective cap. Plastic cased high temperature ceramic base. 14 AWG red power cable wire. Wire loop can be cut at any point for installation. 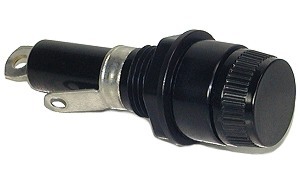 In-line ATO fuse holder with protective cap. Plastic cased high temperature ceramic base. 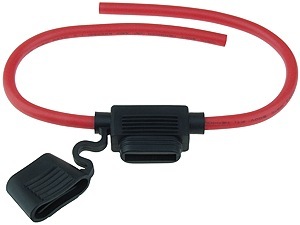 Two 5" long 14 AWG red power cable wire with 1/4" (6.3mm) wide push-on connectors. 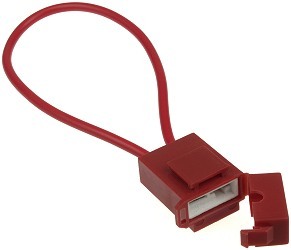 This type of fuse holder is commonly used as a fused jumper wire in battery packs. In-line ATO fuse holder with wire leads and protective cap. 12 AWG red power cable wire. Wire loop can be cut at any point for installation. 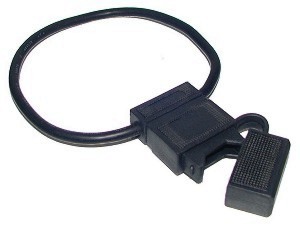 In-line ATO fuse holder with wire leads and protective cap. 12 AWG black power cable wire. Wire loop can be cut at any point for installation. 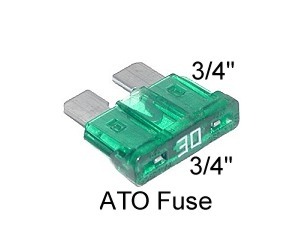 In-line ATO fuse holder with protective cap. 10 AWG red power cable wire. Wire loop can be cut at any point for installation. 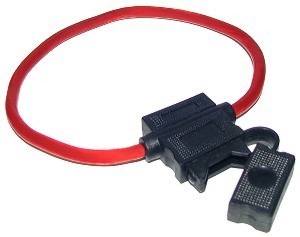 In-line ATO fuse holder with wire leads and protective cap. Two 6" long 10 AWG red power cable wires. In-line MAXI fuse holder with two 5" long wire leads. 10 AWG red power cable wire. Plastic fuse holder housing with protective cover. In-line MAXI fuse holder with two 5" long wire leads. 6 AWG black power cable wire. Bakelite fuse holder housing. 1/4" ID mounting hole in middle of fuse holder. 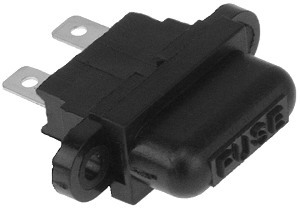 ElectricScooterParts.com carries a wide variety of fuse holders for electric scooter and bikes. 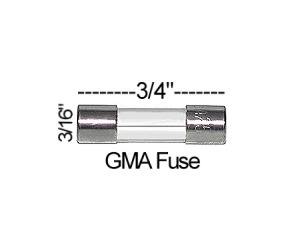 We have fuse holders for GMA, AGC, ATO, and MAXI fuses.